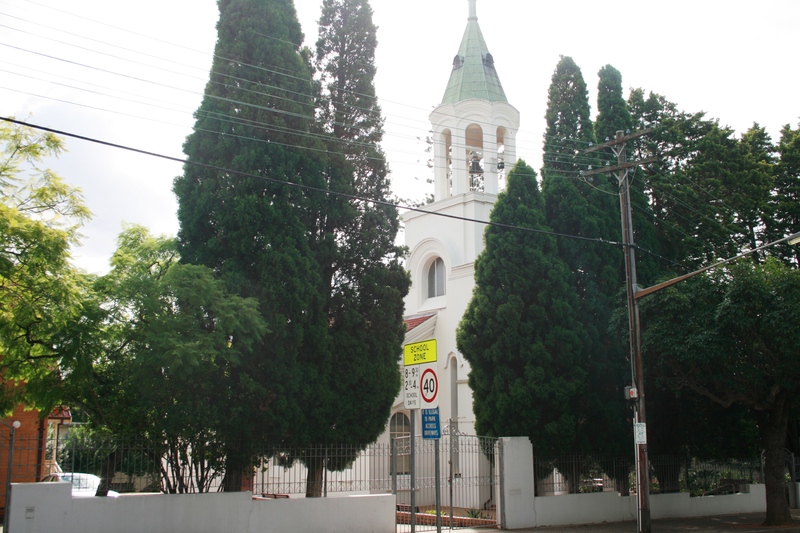 The Parish of Saints Peter and Paul Cathedral of the Russian Orthodox Church is a significant heritage item, listed on the Strathfield Local Environmental Plan. The Royal Institute of Architects (RAIA) has also recognised its significance with the inclusion of the Cathedral on the list of Twentieth Century Significant Buildings. The Cathedral commenced building in 1951 and was opened in 1954. The Cathedral is located at 3-5 Vernon Street Strathfield. Built c.1954, the Russian Orthodox Church is of local significance as the first Church built for the Russian community and for its architectural qualities and considerable streetscape value. Constructed of rendered brick it has a symmetrical façade based on verticality that features a bell tower with arched openings, copper spire and steel cupolas supporting a cross. Arched top windows have flat rendered labels and the roof is tiled. A small weatherboard cottage with a steeply pitched corrugated iron roof, brick chimneys and timber barge board and finial is situated on the southern side of the church and was used a school building until falling into poor condition. The church spire is a local landmark and the church forms part of the Vernon Street precinct. The boundary planting of Bhutan Cypress provides an important landscape element to the street. The Cathedral was built on the Mount Vernon Estate. The Mount Vernon Estate was formed from land owned by brothers John and Donald Vernon, original purchasers of the Redmire Estate. Donald Vernon was traffic manager of NSW Railways and built the home ‘Parkstone’ [which has been demolished but faced Margaret Street]. John Vernon, the NSW Auditor General, built ‘Springfield’ [which has been demolished and faced Redmyre Road]. The Vernon’s subdivided their land c.1880 as the ‘Mount Vernon Estate’, which created Vernon Street, Brunswick Street [then called Redmyre St] and lots on Redmyre Road and Homebush Rd. All properties in Vernon Street are built on the Mount Vernon Estate. A decision was made in 1949 by the Russian Orthodox Church Abroad to build a Cathedral in Sydney. Strathfield was chosen as the location due to its central location and accessibility to public transport. The first stone with Holy Relics was laid on 7 October 1950 by Archbishop Theodore Rafalsky, Archbishop of Sydney and New Zealand. The ceremony brought together Russian and Serbian priests, Anglican clergy and Members of Parliament. Congratulatory messages were received from the Minister of Immigration, Harold Holt, former Minister for Immigration Arthur Caldwell, the Greek Archbishop Theofilakt, Catholic Bishop Gilroy and the Anglican Archbishop of Sydney Dr Mowll. A competition was held for the design of the new Cathedral. The winner and designer was R J Magoffin ARIA, of Bligh Street Sydney. Strathfield Council approved the design of the new Cathedral in July 1950. The estimated cost was £15,000. A consecration of the Cathedral was carried out by Archbishop Theodore Rafalsky and Sydney clergy on 27 December 1953. The house ‘Dunholme’ [former Lot 16], which is adjacent to the Cathedral grounds, was bought in 1953 and Archbishop Theodore transferred his residence there. At this stage, the administrative centre of the Russian Orthodox Church Abroad of the Australian and New Zealand Diocese was located in Strathfield. The Parish House was replaced in 1988 with a new structure. Archbishop Theodore died in 1955 and was buried in the Cathedral grounds. The Parish is known as The Parish of Saints Peter and Paul Cathedral in Strathfield New South Wales of the Russian Orthodox Church [outside of Russia]. Since completion of the building of the Cathedral, a number of building alterations have been made including a verandah extension in 1956, the building of a Church Hall in 1958, additions to the Church in 1979, renovations to the parish house and church in 1988 and the erection of five domes on the roof of the existing Church. Tatarinoff, K & P, Konovets A., Kasperski-Andrews I. [eds], Russians in Strathfield: A Community Profile 1949-1999, The Russian Ethnic Community Council of NSW Inc. & Russian Historical Society of Australia, 1999. © Cathy Jones 2008. This article is subject to copyright and may not be reproduced without permission of the author. Please let me know what times the church is open for mass. As a lifelong parishoner of the Saints Peter and Paul Cathedral I can confirm that the church was never reconstructed to support five domes, even if that may be the secret desire of some parishioners (myself included) so as to have the church building appear to be more of a Russian style! The church is generally open from 6pm to about 8:30pm on Saturday nights and from 9am to about 12 noon on Sundays. Other feast days according to the church calendar have the same timing for the eve of the feast day and then the feast day itself. One notable exception is Easter (which in 2013 is in two week’s time) which is celebrated with a midnight service which actually starts around 11:30pm and finishes around 3am. Come early to find your place! Hi, couldn’t get through to the church via phone. Could someone kindly tell me the time of the Christmas mass this week? Could you please advise if there will be service at church next Saturday from 18:00 to 20:30 (’20th August) ? I don’t know. You will need to contact the Church directly.